Fruits and vegetables are an absolutely critical part of any health-promoting diet, and even more so when it comes to cancer prevention or anti-cancer dietary protocols. They are high in vitamins, minerals, phytochemicals, antioxidants, enzymes and other nutrients, contain lots of fiber which helps to keep the intestines and colon clean, as well as contain countless compounds with anti-cancer properties. 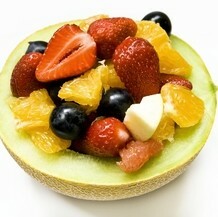 A good idea is to eat a wide variety of fruits and vegetables, preferably of varying colors. Organic is best, while raw fruits and vegetables retain a lot more of their nutrients. The protective effects which one’s diet, in particular fruits and vegetables, offers against cancer may, intuitively, seem to apply more to cancers which are related to the gastrointestinal tract, such as colon cancer, stomach cancer or intestinal cancer. On the other hand, for certain cancers, like those of the ovaries, prostate and breasts, one may be more inclined to believe that hormones play a bigger part. The truth, however, is that diet does play a significant role even in breast cancer. And a recent study has revealed that the consumption of good amounts of fruits and vegetables can reduce the risk of breast cancer recurrence by almost a third. This protective effect, however, only seemed to apply to certain women but not others. The study team had looked at data pertaining to 3,000 breast cancer sufferers in a bid to analyze if low fat intake and consumption of high amounts of fruits and vegetables could play a part in preventing the return of the disease. Such a diet had previously already been linked to reduced breast cancer risk. Half the women were told to consume 10 servings of fruits and vegetables every day, double the daily dose of 5 servings recommended by United States government agencies, as well as to boost fiber consumption and lower fat intake. This group was then compared with a group who were asked to stick to government guidelines. The average age of the study subjects was 53, and the study was published in the Journal of Clinical Oncology. About 900 of the entire group of women reported not experiencing hot flashes, which is a common side-effect of conventional breast cancer therapy. Analyzing the data on these subjects, the study team found that only 16% of those who doubled their fruit and vegetable intake suffered a relapse after 7 years, as compared to 23% of those in the control group. With specific regard to post-menopausal women, the reduction in risk was about 47%.